I have finally ventured into the wonderful world of audiobooks, which I entirely blame on all the bloggers who keep raving about them. I’ve resisted because I work from home–no regular commute to make convenient listening time. But I’ve increasingly had longish drives for social events, and thought I’d try an audiobook–and now I strongly suspect I’m hooked, for at least nine books. 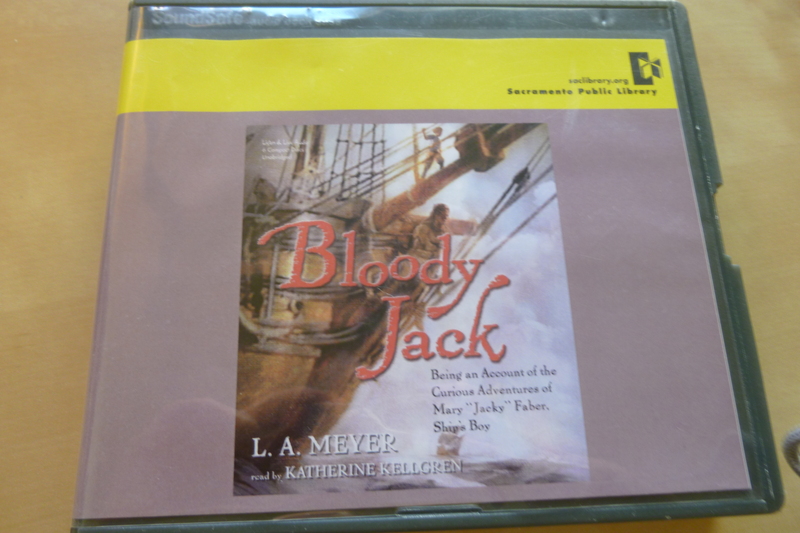 I’ve started listening to the Jacky Faber books by L. A. Meyer on audio, and now I think I’m in for the series. I’ve been reading the books for years as they come out–I recently reviewed number ten, Viva Jacquelina. It’s been a long while since I read the early ones, but I have too many books lined up–where was I going to fit in nine re-reads? Audiobooks seemed like a natural solution, especially because I was guessing these would be particularly good read aloud–and I was right! Katherine Kellgren does a wonderful job with the reading. It never sounds like she’s reading–it sounds like Jacky telling you her story, cockney accent and all. The book is in first person, present tense, making it very immediate. It’s fast-paced (especially as the series goes on) and the audio swept me right along. Jacky is very emotive and dramatic, and Kellgren manages to bring believability to Jacky’s most over-the-top exclamations. Jacky is without question the best part of this very good series. She’s daring and exhuberant and never, ever manages to stay out of trouble. She swears she’s really a coward, but that never stops her from diving into scrapes when the situation calls for it. She’s staunchly loyal, endlessly charming, and one of the most engaging heroines I’ve ever met. Jacky inevitably gathers friends and enemies around her, and it was fun going back to this first book where we get to start meeting major characters. Kellgren gives characters different voices in the dialogue, without getting cartoonish about it. Liam has an Irish accent, the captain sounds stern, and you can just tell immediately that Jaimy is handsome and well-born. The story is wonderful as a book or on audio. The adventures are exciting, Jacky is delightful, and, well, it’s just irresistable find out what she’ll do next!